Ethan Chambers and the Eisenhower Knights, as well as the Youngsville Eagle wrestlers, are set for the Section I Tournament. Eisenhower wrestlers bounced back in a big way after a tough loss to Titusville in the District 10 Team Dual Championships Saturday. 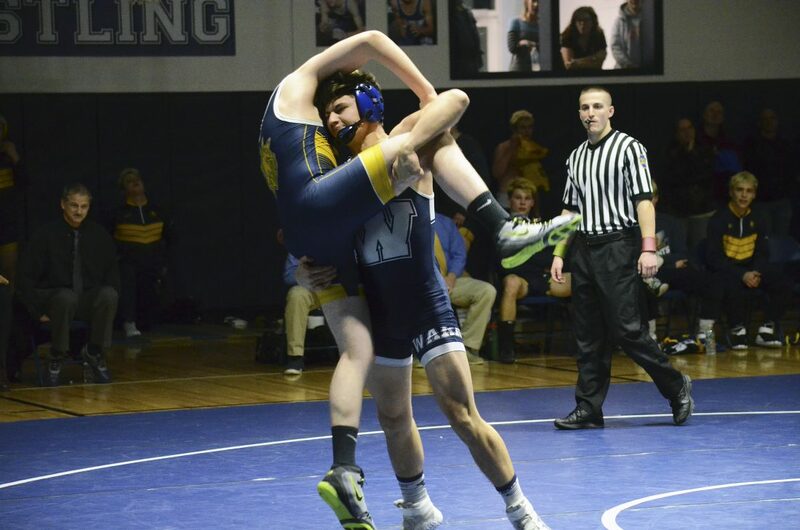 In the Joseph A. Massa Memorial Gymnasium Tuesday, the Knights won nine of the 14 weight classes-five via pinfall-en route to a 44-21 win over the Warren Dragons. Eisenhower came out strong and never trailed in the match. Josh Bortz grabbed an 11-1 major decision over Donovan Fiscus at 138. Nate Holt followed with a 4-1 decision over Kyle Swick at 145 and Garrett Head picked up another major decision, 9-0, over John Fankhouser at 152 to put the Knights ahead, 11-0. Alex Barnett got the first pinfall of the evening at 160 when he decked Zack Zinger in the second period. Jamo Douvlos got the Dragons on the board with a second period pin of Tristen Wilcox at 170. Warren’s Alex Anderson and Eisenhower’s Ganon Jaquay jockey for control during their 132-pound match at Warren Area High School, Tuesday, Feb. 5, 2019. Anderson won a 7-0 decision, but the Knights came away with a 44-21 match win. Ethan Chambers and MaBrukhe Tagba battled back-and-forth through the first period of their 182-pound bout, with neither grappler able to score. Tagba chose to start the second period in the top position and quickly locked Chambers in a cradle. Chambers was able to prevent Tagba from turning his shoulders to the mat, and with just over 40 seconds remaining in the period rolled through for a reversal and decked Tagba at the 3:33 mark. “When he locked me up, I was just thinking I didn’t want to get pinned,” Chambers said. Instead of being in a tight, 17-12 contest, the sudden reversal put the Knights up 23-6. “It really put the momentum in our favor,” Black said. 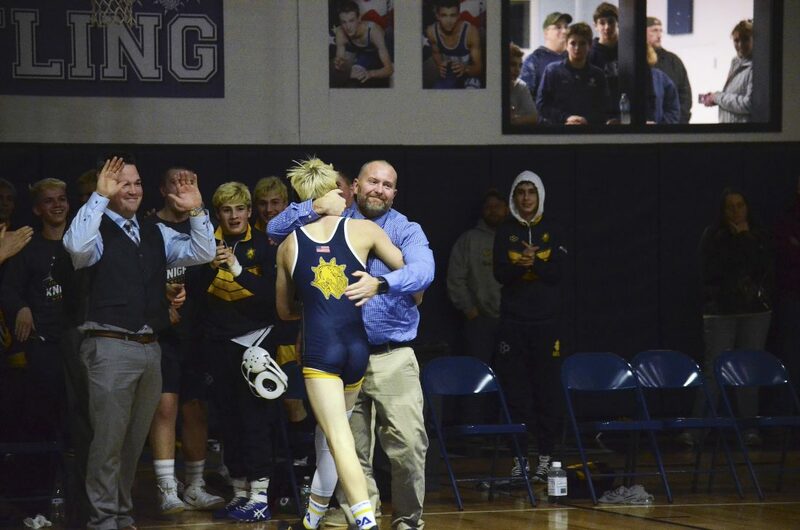 Eisenhower coach Kris Black embraces Easton Hedman following his pinfall victory over Warren’s Ryan Madigan at 126 pounds in the Joseph A. Massa Memorial Gymnasium, Tuesday, Feb. 5, 2019. Hedman scored the Knights’ final points of the night in a 44-21 win over the Dragons. Cael Black kept it going for the Knights. He fended off a late rally from Joey Arnold at 195 to hold on for a 6-5 decision. Jacob Hayes got Warren’s second win of the night with a 9-3 decision over Jesse Gourley at 220. Warren’s Billy Anderson had just gotten an escape point in his 285-pound match with Joey Bauer to cut Bauer’s lead to 2-1 when he rolled his ankle getting back to center mat. Anderson fought through the injury, but Bauer was able to capitalize on the limited mobility and put Anderson to his back to give the Knights a 32-9 advantage. Connor Papalia’s forfeit win at 106 cut the lead to 32-15. With four matches remaining, the Dragons still had a mathematical chance to pull out the win. Warren’s Jamo Douvlos lifts Eisenhower’s Tristen Wilcox during their 170-pound match at Warren Area High School, Tuesday, Feb. 5, 2019. Douvlos picked up a second-period pinfall victory, but the Knights rolled past the Dragons 44-21. 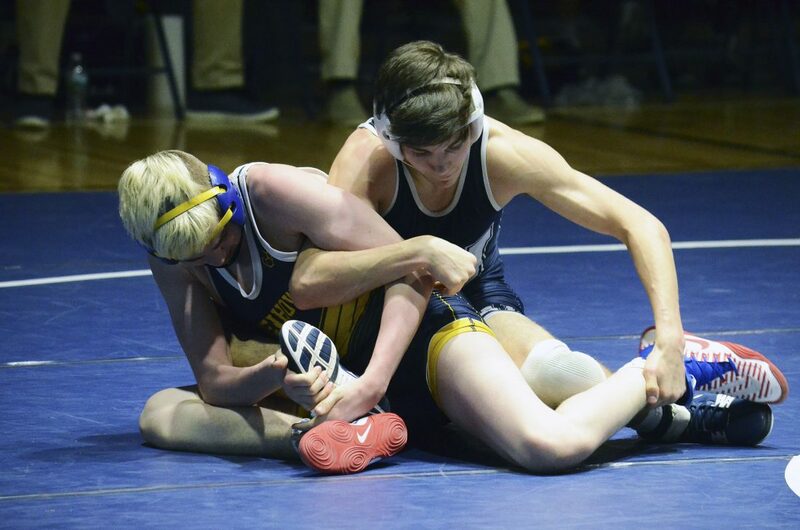 Logan Jaquay, who had been the subject of some social media trash talk earlier in the week, emphatically ended that chance with a second period pin of Christian Papalia at 113. “That was a little extra motivation,” Black said. Avery Smith picked up a 7-0 decision over Jake Williams at 120. 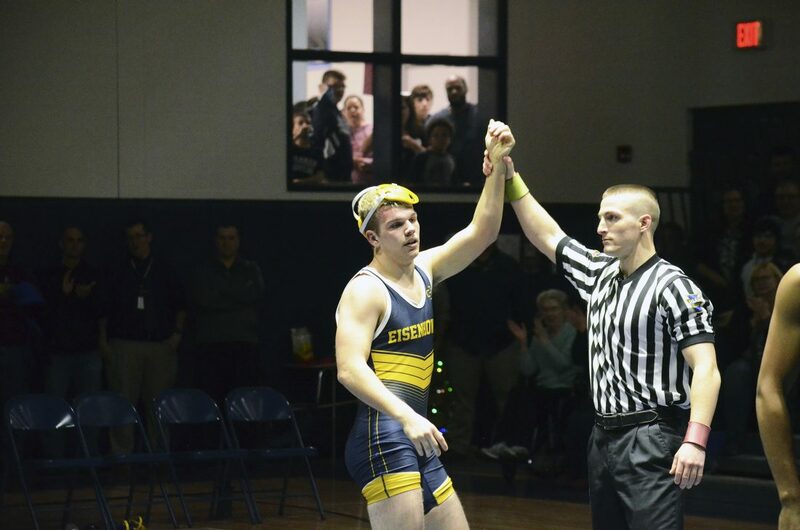 Despite the lopsided score, the home crowd rose to its feet for the 126-pound battle between Eisenhower’s Easton Hedman and Warren’s Ryan Madigan. Madigan started quickly and looked to have Hedman in a compromising position, but Hedman was able to get out of it and score a takedown himself. It was the only points scored in the first period. Hedman chose to start the second on bottom and again fought his way out of a tough spot. This time, he reversed Madigan and cradled him into a pinning predicament. Hedman earned the fall with just over 30 seconds remaining in the second. Alex Anderson grabbed a 7-0 decision over Gannon Jaquay to close out the match. The Dragons will get right back on the mat today as they host Corry. Warren will hold Senior Night festivities prior to the match. Eisenhower now turns its attention to the individual postseason. The Knights will compete in the Class 2A Section 1 tournament Feb. 15-16. Youngsville’s Gage Hendrickson is pressured as he brings the ball up the court by Union City’s Miles Parker during the second half of Tuesday’s game at Youngsville High School. The Bears pulled away in the second half for a 77-50 victory over the Eagles. Youngsville point guard Joe Mack fires a pass. Youngsville’s Brady Olewine races up the floor during Tuesday’s Region 3 contest against Union City. Olewine finished with a team-high 19 points, but it was the Bears who came away with a 77-50 win.